Will lightning strike twice for Andy Rubin? Home News Will lightning strike twice for Andy Rubin? Often referred to as the father of Android, Andy Rubin is one of the more renowned co-founders of the operating system. After selling the platform to Google in 2005, he continued working with the company up until 2014. Following his departure, Rubin founded a technology incubator named Playground Global. 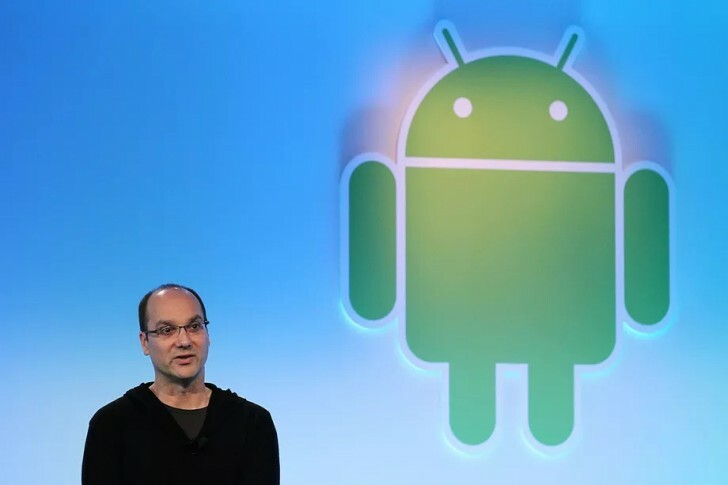 Andy Rubin alongside the logo for Android OS. According to a recent report, Rubin has now created a new company called Essential Products Inc. The small company comprises 40 people, with many having been employed by either Apple, Samsung or Google in the past. The tight-knit company aims to introduce new products to the public including mobile and smart home hardware. It seems the company is hard at work on a high-end smartphone. The design is expected to feature an edge-to-edge display with top of the range specifications. The phone is also rumoured to gain additional hardware functionality with a future modular device. The modular function will most likely work with the help of magnetic connectors, something similar to the Moto Z and its Mods. We’ve also heard the phone may borrow a feature similar to Apple’s 3D Touch to enhance interaction with the device. Size-wise, it will be smaller than the iPhone 7 Plus and will use high-end materials such as metal and ceramic. Rubin allegedly pitched the concept to US carriers at the recently concluded CES with the prototype’s display coming in at 5.5 inches. 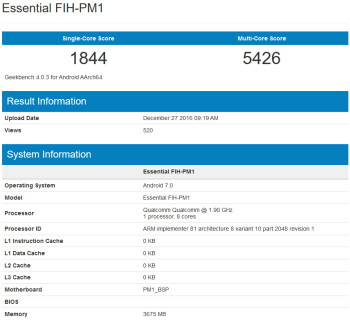 The new device from Essential Products may have been benchmarked last month. Under the name Essential FIH-PM1, here are the scores it managed. Are we looking at the specifications for Andy Rubin’s future smartphone? What do they tell us? Barring the single and multi-core scores that suggest high-end hardware, we see the phone running Android 7.0 Nougat. This means we might have to wait until Rubin’s rumored new operating system. In terms of other hardware, we will most likely see the Qualcomm Snapdragon 835 chipset at the heart of the device with 4GB RAM. There’s no hint at screen resolution nor is there a mention of a proprietary port for modularity. The code name for the device may seem complicated but it does tell us something more about the handset. 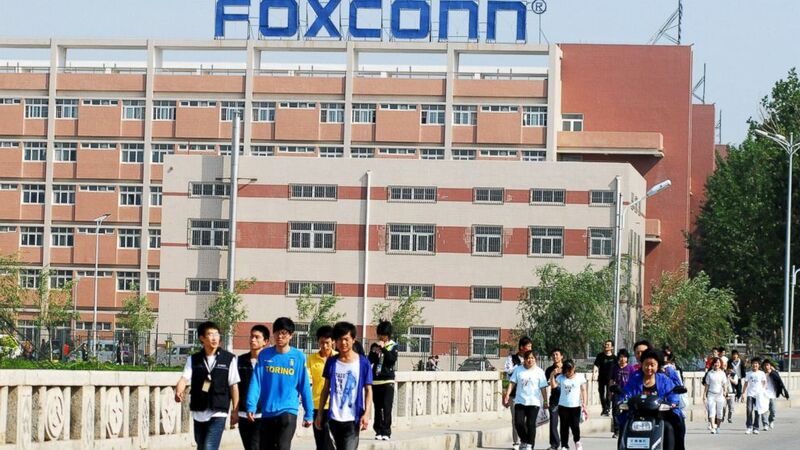 The contract manufacturer for the smartphone will most likely be Foxconn, which we can tell from the “FIH” in the code name (Foxconn International Holdings). Going by previous leaks from the company’s facility, we may be seeing more of the smartphone very soon. Essential Products may be aiming to tackle the likes of Apple, Samsung and Google’s latest flagships with this handset. We can expect it to be priced similarly and bring more choice to consumers in this price bracket. Expect to learn more about this device by the middle of this year. Rubin has already been successful in the past. His operating system was a mega hit. But will lightning strike twice for him? The rumoured smartphone sounds very interesting, but are you convinced? Let us know down below. Eve Smart Mirror: The smartest of them all?